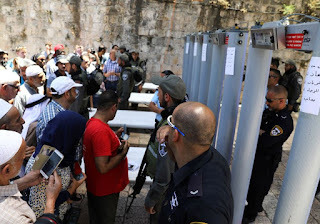 Israel: Six people have ben killed in the bloodiest spate of Israeli-Palestinian violence for years, prompted by new security measures at Jerusalem's holiest site.Three Israelis were stabbed to death in a Israeli settlement in the Israeli-occupied West Bank on Friday, hours after three Palestinians were killed in violence prompted by Israel's installation of metal detectors at entry points to the Noble Sanctuary-Temple Mount compound in Jerusalem's walled Old City. Palestinian President Mahmoud Abbas announced he was freezing ties with Israel over the installation of metal detectors, dealing a blow to fledgling Trump administration efforts to try to renew long-dormant peace talks.The metal detectors are perceived by the Palestinians as an encroachment on Muslim rights and portrayed by Israel as a needed security measure following an attack that killed two Israeli policemen.A Palestinian sneaked into a home in the West Bank Israeli settlement of Halamish after nightfall on Friday and stabbed to death three Israelis. The military said the attacker apparently jumped over the fence and infiltrated the family's home as they ate the traditional Sabbath evening meal.It said the Palestinian killed a man and two of his children, while a woman was wounded and taken to hospital.Israeli media said the assailant was in his late teens and had posted on Facebook that he was upset by the events at the Jerusalem shrine. 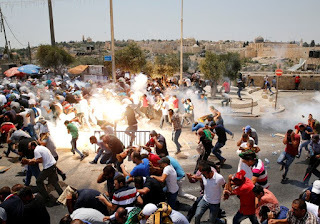 Earlier on Friday, thousands of Palestinians in Jerusalem and the West Bank clashed with Israeli troops, burning tyres and throwing stones and firecrackers. Troops fired live rounds, rubber bullets and tear gas, killing three Palestinians.Israel decided to install the metal detectors at the entry to the shrine on Sunday.It includes the al-Aqsa Mosque, the third-holiest site in Islam, and the Dome of the Rock.It was also the site of an ancient Jewish temple, the holiest place in Judaism.Despite international pressure, Prime Minister Benjamin Netanyahu's security cabinet decided early on Friday to keep the metal detectors in place, saying they were needed to prevent arms being smuggled into the shrine. Jerusalem's top Muslim cleric, Mohammed Hussein, said protests, including mass street prayers outside the shrine, would continue until the devices were removed.He told worshipers on Friday they should prepare for a "long test of wills" with Israel.